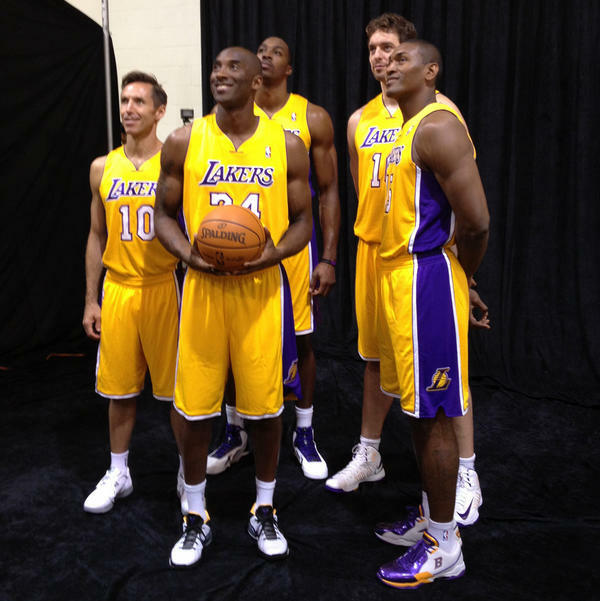 Seeing them all together at L.A.'s Media Day is a bone-chilling experience for fans of any of the NBA's 29 other teams. It's been just under two months since the Los Angeles Lakers traded for Dwight Howard, completing the last step in the summer-long creation of a basketball Voltron. Between the Olympics and the start of the NFL season, it's been easy to forget about L.A., or at least put aside the weird mix of terror and excitement provoked by Steve Nash, Kobe Bryant, Dwight Howard, and Pau Gasol (and, uh, Metta World Peace) playing for the same team, a NATO pick-up demon. And somewhere, atop a mist-shrouded mountain deep within Nepal, after hiking there from the Indian Ocean, Derrick Rose pushes aside a curtain of wooden beads sweaty with condensation. He sees Phil Jackson sitting Lotus-style, hovering an inch above the ground. "Phil," Rose says, and he holds up the photograph. "What do we do?" And Phil says: "Let Kobe shoot."